Your goods and services suppliers are integral and autonomous. They can be your biggest asset as well as a tremendous risk. We've developed a solution that centralises and structures all supplier assessment, communication, data collection, and compliance monitoring activities. We've included tools to register, categorise, and risk rank suppliers, develop and deploy pre-qualification assessments, keep on top of expiring documentation, and schedule ongoing data collection and information requests. Suppliers are a vital part of your business. Selecting suppliers who align with your internal policies is prudent to ensure your end-to-end production process is sustainable. Collect data and information from your supply chain as part of your pre-selection and performance review procedures. Build your own reusable library of questionnaires, compliance reviews, audit tools, and data collection templates tailor-made to your supply chain management requirements. Automatic, customisable email notifications ensure that your supply chain representatives are aware of your information and data collection requirements. Includes a secure login area for your supply chain to respond to risk mitigation or topic-specific questionnaires and requests to upload data and information. Data captured from campaigns can be viewed and analysed through the Campaign Performance Dashboard and the Survey Data Analysis modules. Optional linkage to iSystain risk register to assist with the evaluation of the risk level of the suppliers’ goods/and or services. Optional linkage to iSystain incident solution showing all incidents, hazards, and non-conformance reported that involved the supplier. View all files attached by the supplier, internal contract, or supplier management personnel in one location. Integrates safety, environment, social, and ethics criteria into your procurement process and reporting tasks. Single location for all supplier management records including selection assessments, attachments, performance review results, data collected, actions, and incidents. Assign follow up actions and reminders to keep suppliers’ insurances and other time-based documents up to date. Reduces undesirable performance and complaints resulting from supply chain issues. Increases transparency and data integrity and provides audit trail of supply chain management. Reduces costs as a result of improved collaboration and aligned reporting from your supply chain. Fosters a greater alignment between the sustainability practices of your supply chain and your organisation’s requirements. Integrates supplier management performance into your sustainability reporting. The Supplier Ranking dashboard simplifies supplier management by visually ranking each of your suppliers against performance criteria material to your business. Easily sort and filter your suppliers by risk, goods or services offered, sector or activity. Matching suppliers are then ranked in terms of their performance in criteria such as commercial, CSR/social, environment, quality, safety or any criteria you wish to measure your suppliers by. Each criteria is assessed by deploying configurable questionnaires to each of your relevant suppliers. 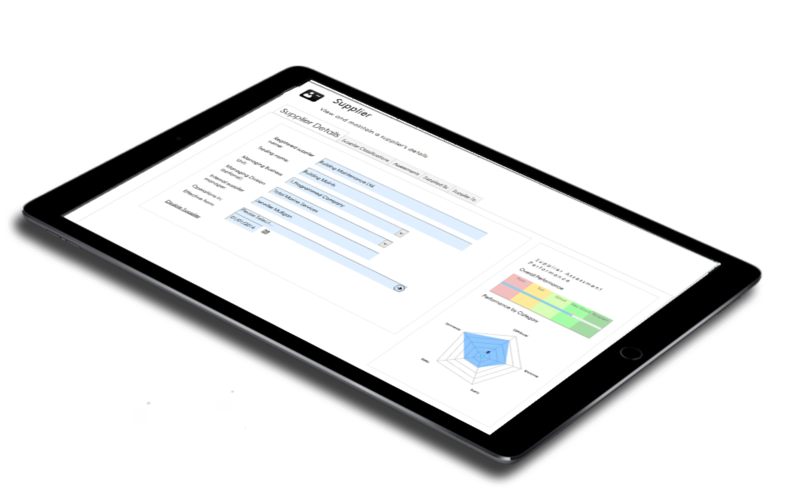 Assessments can be performed as many times as desired and the ranking dashboard will display your supplier's most recent assessment results. Our Supplier solution manages the end to end cycle of pre-qualification, approval, document upload and tracking, communication, compliance monitoring and performance review.